Shop for The Industry's Hottest Promotional Items Right Here! In the promotional products industry, we strive to be different. Different. That is a phrase that is overused on a daily basis. We are not speaking solely of our competition, but also on a society-wide level. It's very easy within the advertising specialties industry to purchase a template online store with all the bells and whistles. AdSpecialtyProducts.com chose to go a different way, painstakingly designing our site with easier navigation, better graphics, and a very easy to understand purchasing process. We feel that we have been rewarded for "taking the path less chosen" because over the past few years, this website has brought us some of the best customers that we have ever had. As you browse our site, you will no doubt be inspired to either purchase promotional items, or you will be given an idea for an item that you would like for your company that is not currently in the store. Ad Specialty Products is a worldwide sourcing guru and can provide just about ANY promotional product under the sun, at great prices. We welcome your ideas as a way to grow our site with products that our potential clients are searching for, and we will put your ideas into action as well as accommodate your existing orders. Our founder, Dan, grew up in the promotional pen industry, which is one of the reasons that this site places a heavy emphasis on personalized plastic and metal marketing pens. Dan's years of experience in the industry not only led him into relationships with all of the best company logo pen suppliers, but also brought him into the rest of the industry through his participation at numerous trade shows, expos, and conventions. Years later, we still utilize these relationships with the same suppliers, and receive great pricing which we pass onto our customers. Even though today we sell thousands of different advertising specialties, writing instruments will always hold a special place in our founder's heart. As you browse our site, you will notice that many of our promotional products items are priced with special...benefits if you will. A large number of our items include free shipping and setup, and quite often then also include art assistance. This might not seem like a big deal, but most of our competitors charge $25/half hr. for art help and redraws, which can add up quickly. A great example of how our artists can take your promotional items order from ordinary to extraordinary is with our tote bags. Most companies just want text on their custom totes, which looks great because of the large imprint area. We often suggest reformatting the text so that we maximize the imprint area to really get your message across. If it's a company without a logo and a more basic message, we can whip up a logo to make your message or slogan stand out better. 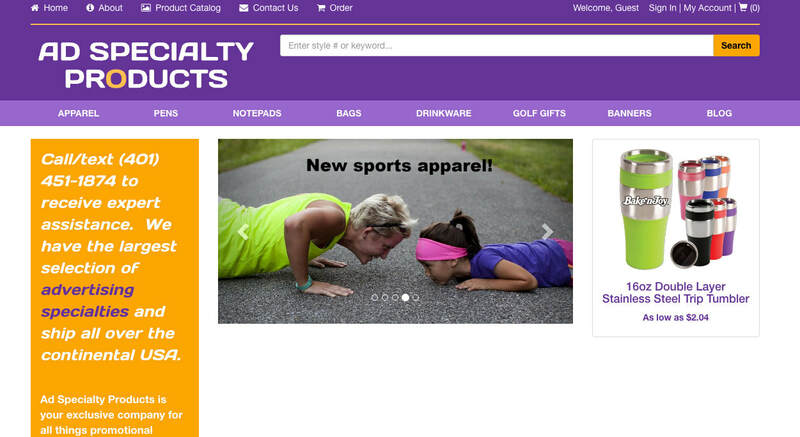 You will notice that within our store landing page, we have chosen to make the first category our "specials". Our specials page are predominantly all inclusive deals that you can't find anywhere else, with super easy ordering. We receive a lot of great orders from this category, as you can usually find a great deal on a pen, hat, drinkware item, or bag. We try to include something cool from every category in the specials section because it is usually where bargain shoppers and people in a hurry tend to look first. Other clients tend to make a direct route toward our pens section, or have Googled "cheap promotional pens", "plastic promotional pens", "metal promotional pens", or "personalized plastic pens", OR some variation of the hundreds of keywords under which our pen section can be found. Writing instruments have come a long way over the past ten years, in terms of quality, materials used, and even manufacturing, imprint, and import processes. In recent years, the eco friendly promotional products phenomenon has reached epic proportions, and brought with it many interesting writing instruments. We have a pens made from bamboo, recycled water bottles, corn plastic, and recycled paper just to name a handful. Our printing methods have never been more advanced, allowing us to do full color digital wraps on some items, as well as clip printing on writing instruments, and dome imprints that give a three-dimensional impression to your logo. In regards to the writing instruments category, item color and imprint color have an unprecedented number of options. We have translucent plastics, plastics with an anodized aluminum look, frost finishes, neons, pastels, and more. Certain items have the ability to match the exact pantone color of your logo, for an additional fee as mixing is involved. We have a new type of refill called a "hybrid" that is available in some of our items. The hybrid refill is special because it writes ultra smooth like a rollerball, but dries quick and is tough to smear, like a ballpoint. Another benefit of our hybrid writing instrument refills is that they last longer than traditional rollerballs. For the past 5 years, we have enjoyed the prevalence of combination promotional pens, or writing instruments that are multi function. We sell the ever-popular laser pointer pen combo, LED combo, as well as the capacitive stylus pen combo. Highlighter combos have been around for at least 10 years, but there are more options than ever before. Many of these items are lower in price than ever, because of our advanced import capabilities combined with reduced cost of production because of automation. As we move into the high end writing instruments categories, we see more and more companies opting for rollerball pens, or even fountain pens. Fountain pens make a great executive gift, and are still seen quite often at ceremonial events. We are authorized representatives of a large number of high end writing instrument companies, including Waterman, Parker, Sheaffer, Quill, and Bettoni to name a few. Some of the items are pricey, but make a lasting impression when you take the time to have us engrave a person's name or logo on the item. Customization is the extra step that helps your clients to know that you truly care. Personalized Tote Bags is another category of which we are extremely proud. We have an extensive selection of budget and luxury/fashion totes, and have gotten rave reviews for our ability to extend beyond our competition's "ho hum" selections. We offer a variety of eco friendly totes made from recycled poly material, which is good for the environment and an excellent choice for a durable budget tote. With low prices like ours, you'd be crazy to not choose an eco friendly option for your next trade show. A lot of customers ask us how we are able to offer such reasonable all inclusive pricing on bags. Our main reason for our low prices is our low costs. A lot of our totes are machine produced. One of our most extreme examples of this is our die cut handle tote. It is a trade show quality tote bag with handles cut into the top of the bag rather than sewn on. We pass our savings on directly to our customers, and the die cut totes have proven to be a big hit. We also have manufacturers that, on certain items, heat seal the totes instead of sewing the panels together. This creates a very strong bond, and a very strong bag, at a very low price. As mentioned previously, our company logo tote bags section also offers a luxurious selection of promo totes that are borderline high fashion. One example of our stylish higher end totes includes the introduction of our gloss/laminate totes. Some of these totes are solid colors, and some are plain, but all of them receive a high gloss treatment sure to make your logo stand out while increasing your brand visibility. These particular custom printed tote bags also have the added benefit of being easily wiped off after a day at the beach or a cookout because they don't absorb stains as easily as traditional matte bags. Our favorite gloss totes in terms of style are our black gloss tote and gold gloss totes. These are personalized tote bags with your company name or logo that rival the style of many high end boutiques. These totes are $1-3 more than our normal matte tote bags, but still cost less than a quality t-shirt and make the impression of a far more expensive item. On the other end of the customized tote bags spectrum, we have the all natural totes. Many of our natural totes are eco friendly, and are made of materials such as un-dyed cotton, cotton canvas, or jute material. Our organic cotton totes have always been a huge seller, and are great for farmer's markets. Our larger personalized organic cotton tote bags are perfect for days at the beach or out on the boat. We even have a cotton tote that comes with a beach mat/yoga mat! Regardless of function, our natural totes are beautiful and affordable, and are, in some occasions, available with colored trims. We like to keep it simple, and these organic cotton tote bags are a great, simple promotional item. As you continue to scroll down our store page, you will see our promotional keychains section. We Filled this section with all kinds of fun and affordable custom company logo keychains, bottle openers, lights, tools, and more. Some of our favorites include the animal shape bottle opener keychains, for which we have received rave reviews. These custom aluminum bottle openers are not only affordable, but they have a super long promotional lifespan because people tend to put them on their keychain and leave them there for YEARS because of sentimental value. We have bottle opener shapes that are perfect for the tourism industry (flamingo! ), sports teams, musical groups, and more. In fact, just last week we sold a bunch of guitar shaped promotional bottle opener keychains to an up and coming country band called Southern Sky. There's a picture of the actual item that we sold them in our store, be sure to check it out! If there's one concept that we feel you should grasp when visiting this promotional products website, it is that we are 100% customer service oriented. We know how good it feels to be treated with respect by a supplier, when so many companies seem to have forgotten who the customer is. We never forget that you are the customer, and that is what makes us different.